However, evidence shows that all of that screen time is affecting our health. Brain function – too much screen time has been shown to damage the brain in several ways. Multiple studies have shown that too much internet use or online gaming causes parts of the brain that govern empathy, planning, prioritising, organisation and impulse control to shrink. Eye strain – too much exposure to the blue light emitted by digital devices can cause eye strain, headaches, itchy eyes and blurred vision, as well as effecting your sleep patterns. Poor posture – slouching over digital devices can damage muscles nerves, tendons, ligaments and spinal disks. Lack of sleep – using screens before bed affects your ability to fall asleep in several ways. Firstly, the cognitive stimulation of responding to emails or messages, watching videos, etc., increases your brain’s activity and prevents it from settling into a restful state. Secondly, the light emitted from screens impairs your brain’s production of melatonin, the chemical needed to regulate your sleep cycle. Furthermore, unnatural sources of light can trick your brain’s natural ability to know when it’s time to sleep. Weight gain – studies have show that a combination of excessive screen time and low physical activity (let’s face it, the more screen time you have, the less physical activity you are doing), increases the risk of obesity, diabetes, heart disease, high blood pressure and bone and joint problems. Depression – a UK study has indicated a strong link between heavy internet use and depression. We’re not proposing a phone ban, but a little bit of digital detoxing can bring huge benefits to your health. Try these tips to reduce the amount of screen time you have each day. 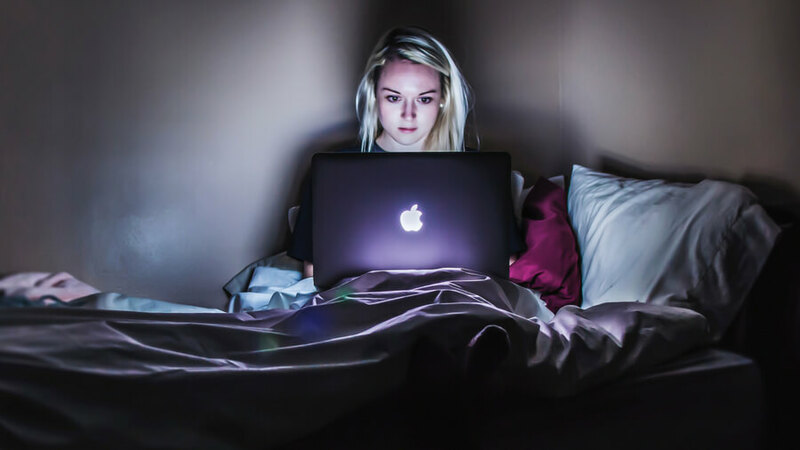 Try banning screens from the bedroom – you may love catching up on your favourite TV series in bed or scrolling through Instagram before you go to sleep, but this habit is playing havoc with your sleep cycle. Try reading a book or listening to a podcast before you drift off. This is relevant to when you wake up to – many of us reach for our phones first thing in the morning – but it is far more beneficial to wake up with a shower, coffee or exercise. Be aware of how often you open up your smartphone simply because you are bored – and swap if for another hobby such as reading, listening to music or an audiobook, walking or crafting.